Introduction: What is that bridge, and why is it here? Hi! Lisa here. 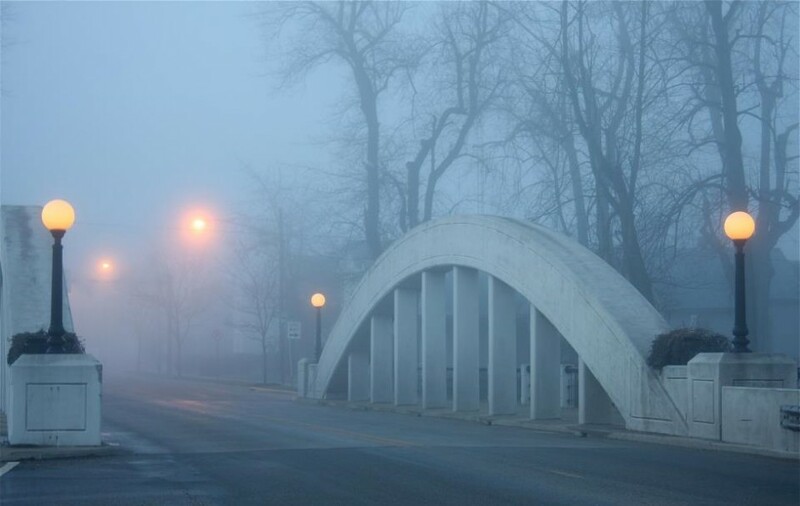 You might be wondering why there is a foggy bridge on my blog. When I started the OMDE program at the University of Maryland University College last semester I REALLY felt lost. There were words in the course description that I had never heard or read before – pedagogy, for example – and I have a reasonably large vocabulary. However, before last February, it was mainly focused towards business, science, specifically health and pharmacy with a good mix of naval terminology following 23 years in the Navy Reserve. I’ve also read a lot. I describe my undergrad degree in Information Management as the translator between the user and the geeks. My minor had been in business and I recently completed a Master’s program in Human Resources. How does one get from one place to a totally unattached place? I have to build a bridge. I need to bridge between the knowledge and experience I have and the knowledge and experience I need to succeed in DE. I have a few favorite bridges. One is the bridge in Lucerne, Switzerland. I fell in love with it over Spring Break in 1980 when the German and French teacher at Sherwood High School sponsored a trip to Europe. Another is one I found in April between the Seminary of the Eastern Baptist Convention of Cuba and the retirement home next door just outside of Santiago de Cuba. I have known the Brooklyn Bridge since I was in elementary school and we lived in New Jersey and took regular trips ‘into the city’. The bridge I have known and loved the longest, however is the foggy bridge pictured at the top of this blog. It is over the Salamonia River in Portland, IN on Meridian St., just where it crosses W. 2nd St. My grandparents lived right beside this bridge when I was a child; in fact, it seemed to be part of their side yard. If you look closely at the far side of the bridge, on the right, you can see a dark shape that is the house they lived in until 1974. That bridge is solid, it is familiar, and I hope that the bridge I am building to this new area is solid and becomes familiar. I also think it is beautiful, and I hope I come to appreciate DE in the same way. The fog? Hopefully that will clear as I continue my DE journey, but this picture is so beautiful that I doubt I will change it to a clearer picture of the bridge…. I think I like the way it shrouds my memories of that house. I would also like to thank photographer Becca James who has graciously granted me permission to use this photograph that she took in 2007. As soon as I figure out this blog stuff a little better, I will include the credit on the picture. Great metaphor, and a very interesting entry on your DE experiences so far in this program. Be sure to enter content often, at least once a week. Right now your text is on top of the photo; as you wrote you need to figure this out a little better so I look forward to seeing the bridge! I think I’ve got it fixed. It took a lot for me to figure it out. It may change again as I mess with the site. I will be posting more also. I wrote a couple while at Boy Scout Camp, but was unable to access wi-fi due to weather.